The idea first took shape in a conversation between Kent Cavender-Bares and his brother Charlie Bares. Charlie is a farmer in upstate New York. In discussing the problem of how best to fertilize his crop of corn, Charlie raised the issue of height. 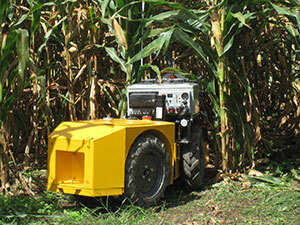 Once the corn becomes too tall, his machinery is inhibited by the stalks and cannot navigate the rows. “So, I said, ‘what happens if we go low?’” recalls Kent. And with this simple idea they were onto something. He and Charlie talked further and worked out a concept for a compact machine that can run between rows of corn, delivering fertilizer directly to the roots. “Then we began to talk to our other brother,” says Kent. The third brother, John Bares, is the president and CEO of Carnegie Robotics LLC, and happens to be one of the world’s leaders in robotics. In May 2012, the three men founded Rowbot Systems and appointed Kent CEO. The Rowbot team began to shop their invention to investors. As a means to this end, Kent, a Minnesota resident, entered Rowbot in the Minnesota Cup, the largest new venture competition in the country. Entered in the CleanTech category, Rowbot withstood rounds of evaluations and in August emerged as one of 18 finalists and ultimately finished as runner-up. Nitrogen is unstable, and whatever doesn’t bind to the soil during application leaks into water or the atmosphere. “Nitrogen is 300 times worse than carbon dioxide as a greenhouse gas,” Kent notes. “It’s a noxious gas, it’s hard to deal with and has safety issues,” says Kent. The Rowbot system involves 22-inch vehicles that will work in teams with multiple machines running 24 hours per day, 7 days per week. The type of fertilizer used will most likely be the widely available liquid urea ammonium nitrate. The plan is to offer the Rowbot system as a service to farmers in the corn belt, starting with Minnesota, then Iowa, Illinois and Indiana beginning in summer of 2014. The cost to farmers will be $10 per acre. Initially, the service will be provided through retailers who will be given a cut of the profit for brokering the deal. Long term, the intention is to provide the Rowbot system to farmers directly. Having spent a million dollars of their own money to reach this stage of the game, Rowbot’s founders are eager to expand. The immediate goal at present is to raise a large round of venture capital. Two key points keep Kent’s outlook positive: the pressing nature of the unmet need the company seeks to address, and his confidence in the product. In practical terms, all systems are go. Ag partners have been lined up and the all-terrain Rowbot has been successfully field-tested in four states, three of which are in the corn belt. “We’ve achieved a key milestone proving to investors we’re on the right path,” says Kent.